Blur Busters Forums • View topic - A FreeSync screen to make 30fps games bearable? so glad you’ve opened up an XBOX subgroup. The amount of information available online is not quite satisfying, and the monitor manufacturers aren’t as capable answering Xbox questions as they are supporting PC users. So yay for this! A few weeks ago I decided to upgrade my Xbox setup to welcome my new one X, and it’s been quite a ride, with countless returns and trial & error. The crux lies in the fact that Xbox Games nowadays are mostly locked to either 30fps or 60fps. I began my journey with a Samsung C27HG70, which turned out to have substantial motion blur and double images in 30fps games, which is still „most of them.“ Awesome monitor at 60fps though. I’ve then early-adopted the AOC Agon 273QCX, and it’s basically the same story - 60fps Xbox One X and PC gaming looks grand, but 30fps Xbox one X games judder like there’s no tomorrow. The last attempt at blur-free 30fps Xbox gaming was the venerable BenQ DyAc, and while the motion blur was less pronounced after some tweaking, it was still there. Seeing multiple Washington Monuments while panning across the Division 2 Beta just didn’t feel right. What seems to work in getting 30fps games to look smoother, even if it introduces a handful of ms of lag, are motion interpolation technologies, like LG’s TruMotion. The thing is - I can only find that in TVs, not in Freesync monitors, and I’m kinda stuck on 27”. What Freesync screen out there can make 30fps Xbox one X games look a bit smoother, in a package of about 27”? I’m way past insisting on screen technologies, refresh rates or resolution. I just want RDR2, Division 2, Assassins Creed and and GTA to look smoother. Re: A FreeSync screen to make 30fps games bearable? From my limited knowledge, what you want would require an evolution of the way Freesync/VRR currently works on Xbox, any others with better knowledge feel free to correct me. Freesync range on Xbox is not technically defined, most games as you know are capped at 30fps or 60fps, in addition adaptive-vsync is quite common on Xbox games and this is apparently not compatible with Xbox Freesync according to Digital Foundry (since their initial testing, maybe that's changed or not). Also according to DF The Division 2 is an adaptive vsync title on Xbox at least the beta test they looked at. There is a VRR section under capabilities in the Xbox store but there are hardly any titles there and it does not state what range they operate in my guess is all are 60fps and from my experience Freesync on Xbox is really only for 60fps titles, a lot of 4K Freesync monitors are 40-60Hz range only. Freesync monitors databases show 30Hz is the lowest they go regardless of resolution, the Samsung C27HG70 is 48-144Hz and likely the AOC Agon 273QCX too. So ideally MS would define a Freesync range say 40-60Hz, then any title which is branded as Freesync/VRR compatible would have a Freesync performance mode built into the game that would auto activate when it sees Freesync is enabled. That would at least allow 30fps titles to climb into the 40's were maybe it could do it's thing. However this would require the support of game developers implementing this mode, barely any even bother to tag their 60fps game as VRR compatible to begin with. So it would take a big shift in the way MS handles Freesync on Xbox to get the ideal outcome. Samsung and Philips from what I've heard have the best motion interpolation for console gaming, both make PC monitors but as far as I know do not have these features on any of them. Is there some other hardware solution, no idea I'm afraid, hopefully one of the experts on this forum can help. upbow wrote: The crux lies in the fact that Xbox Games nowadays are mostly locked to either 30fps or 60fps. 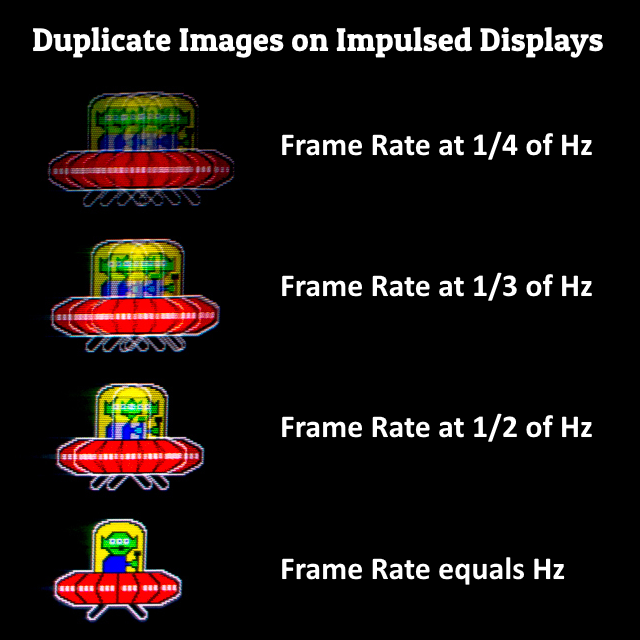 Ideally, you want framerate = refreshrate = stroberate for zero motion blur and zero duplicate images via impulse-based technologies and/or motion blur reduction modes. CRT 60fps@60Hz, Plasma 60fps@60Hz, BenQ single-strobe 60fps@60Hz, ULMB/LightBoost 120fps@120Hz, etc. But 30fps. Ouch. That's a toughie. If you really, really, really want to kill motion blur of 30fps without getting duplicate images.... Currently your only choice is really interpolation. Or a display that can single-strobe at 30Hz (painful flicker). No displays can do that with an XBox console, so you're stuck with using a display that uses low-latency interpolation designed for videogames -- if "low motion blur 30fps" is your number #1 numero uno concern. There are some many valuable scientific explanations of the law of physics explained at Blur Busters Law And The Amazing Journey To Future 1000Hz Displays. In other words, 30fps is SOL without a frame rate amplification technology -- whether it be old-fashioned interpolation -- or futuristic Oculus Asynchronous Space Warp. My own Oculus Rift VR headset is amazing in how it converts 45fps to 90fps perceptually laglessly, for blur-free AND duplicate-image-free AND stutter-free perfect motion fluidity. Thank goodness for this, because strobed 90Hz is comfortable, while strobed 45Hz is painfully flickery.